10. Chocolate Toffee Cupcake – The Trolley Car Café – Each of the four theme parks in Walt Disney World is home to their own Starbucks locations that many guests don’t even realize is part of the giant coffee franchise thanks to subtle logos and theming that immerses each location into the surrounding areas. Disney’s Hollywood Studios is home to The Trolley Car Café which serves up Starbucks products on Hollywood Boulevard but is also themed to look like a building in old Hollywood. In addition to the usual Starbucks menu. The Trolley Care Café also serves up fresh pastries and treats including a delicious cupcake that cannot be missed. 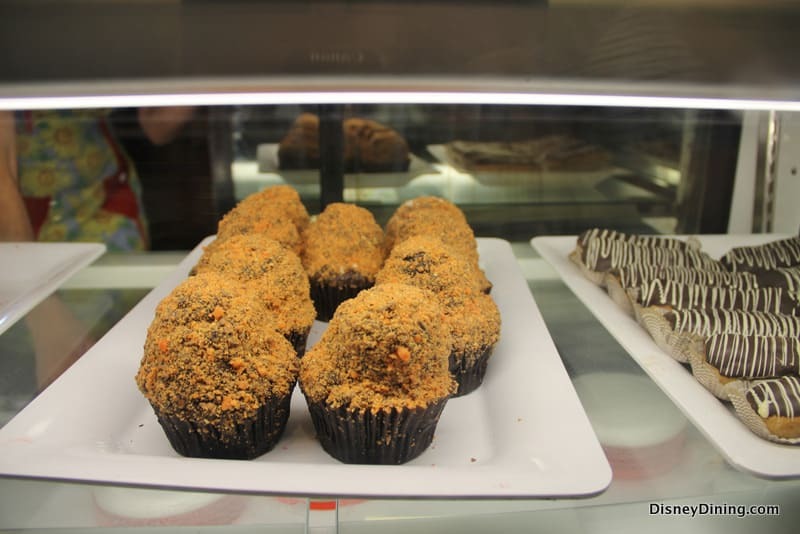 The Chocolate Toffee Cupcake is very similar to the Butterfinger Cupcake that was served at the now closed Starring Rolls Café and it features a moist chocolate cake filled with chocolate ganache topped with buttercream frosting which is then coated with small Butterfinger pieces. The cupcake is decadent and delicious, and the perfect snack to enjoy in Disney’s Hollywood Studios.